Over eight million Venezuelans have participated in the Sunday vote to elect a powerful new congress, which will be allowed to rewrite the constitution, with President Nicolas Maduro hailing the results as a victory for the country’s Bolivarian Revolution. Venezuela’s National Electoral Council said Monday that the turnout was 41.5 percent– more than double the estimates of both the government’s political opponents and independent experts. Speaking at a large gathering of government supporters, Maduro thanked the nation for supporting the vote and said it was one of the highest voter turnouts in the history of the Bolivarian Revolution, with 8,089, 320 casting ballots to select their representatives. “It is the biggest vote the revolution has ever scored in its 18-year history,” he said, referring to the year his late predecessor and mentor, Hugo Chavez, came to power. “Eight million in the middle of threats, there were states where they crossed rivers and mountains, and they voted,” Maduro said. He also hailed the Latin American and Caribbean countries for standing by Venezuela against “interventionist” moves by the United States. “We don’t care what [US President Donald] Trump says, we care about what our people say,” said Maduro, referring to Trump’s promise that he would not accept the vote results. The Venezuelan president said before the new legislative body begins the process to re-write the constitution, the government will in the first step call on the opposition to engage in dialog. However, members of the opposition, which has boycotted the vote, reacted with mockery and anger to the count, which they say appears to be only two to three million. The Sunday vote took place amid a wave of clashes and violence, which led to the deaths of ten people. Anti-government protesters and security forces engaged in street battles across the country as voting got underway early Sunday morning. Those killed include a soldier and a regional opposition leader, according to prosecutors. They also say one of the candidates running in the assembly election was also fatally shot by yet unknown gunmen. The anti-government protesters took to the streets despite a ban on such gatherings, which took effect on Friday and will continue through Tuesday. The government had deployed more than 200,000 military officers to maintain order in more than 1,000 voting stations across the country. The roads to polling stations had been sealed off and only those with registration cards were allowed to pass. Several attacks happened in the capital city of Caracas, where one remote explosion occurred around noon and injured at least six police officers. The opposition has urged further protests on Monday. “We do not recognize this fraudulent process,” said opposition leader Henrique Capriles. Maduro wants to replace the current legislative body— the National Assembly— with a new institution called the Constituent Assembly. The new assembly will have the power to override an opposition-led congress and re-write the constitution. The opposition says the new assembly is a power grab by Maduro. The president, however, argues that it is the only way to restore peace after months of opposition-backed political unrest, which has fueled the country’s economic woes. The latest casualties brought the death toll from the unrest ongoing since early April to 123, authorities said. US Ambassador to the United Nations Nikki Haley also took to Twitter on Sunday to offer Washington’s official response to the vote. The US and its allies, including the UK, Canada, Argentina, Peru, Colombia, Mexico, Spain, Panama and Paraguay, have said they would not recognize the vote results. Washington also blamed Maduro for violence and urged regional and international governments to take strong action against his government. U.S. Vice President Mike Pence called Venezuelan opposition leader Leopoldo Lopez Friday “to address the dire situation in Venezuela,” as concern over U.S. interference in Venezuela’s internal affairs continues to grow. In his phone conversation with Lopez, Pence praised “Mr. Lopez for his courage and outspoken defense of Venezuelan democracy,” according to the White House press statement. Earlier this month, Lopez’s party Popular Will boycotted the dialogue process called by President Maduro to ease tensions between the government and the opposition. Lopez also denounced Maduro’s call for the National Constituent Assembly, demanding the elections for the 545 representatives be canceled. Lopez has a long and sordid history in Venezuelan politics, particularly for his involvement in the deadly “guarimba” protests. 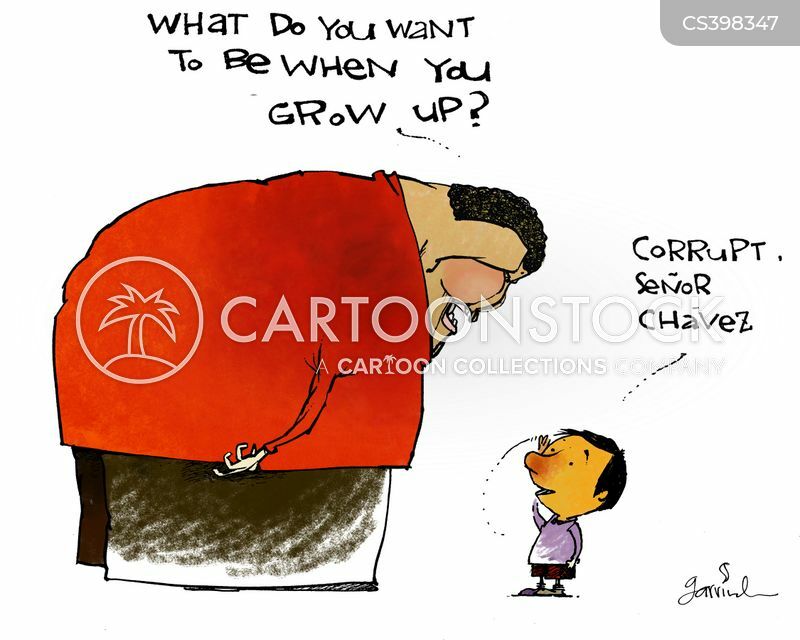 He gained prominence after becoming the mayor of the wealthy Caracas district of Chacao in Venezuela between 2000 and 2008. According to investigative journalist Eva Golinger, in 2002 Lopez began frequenting Washington, D.C., to “visit IRI (International Republican Institute) headquarters and meet with officials in the Bush administration.” The IRI is one of the three foundations of the National Endowment for Democracy, NED, and has been pumping tens of millions of dollars to the opposition groups in Venezuela, including Justice First. In 2014, Lopez was convicted and charged with plotting and promoting the violent street blockades, also known as “guarimbas” in Venezuela. The widespread violence led to the death of 43 people while hundreds more were injured. The violence also cost billions of dollars worth of damage to public buildings and infrastructure. In a video published by NBC Miami Wednesday, Lopez urged the Venezuelans to continue protesting on the streets, stating that Venezuela is facing a “clear and imminent threat” to its democracy. The phone call between the opposition leader and the U.S. vice president comes as the United States escalates its threats against Venezuela. Earlier this week, Washington issued a travel warning telling the U.S. citizens to avoid travel to the South American country and also ordered the relatives of all its diplomats to leave Caracas. Brett H. McGurk, the US special envoy to the international coalition against the Daesh terrorist group, has suggested that Turkey facilitates al-Qaeda terrorists in Syria’s Idlib Province. He said in a speech delivered at a Washington-based think tank on July 29 that Idlib has turned into a “safe zone for al-Qaeda terrorists on the Turkish border,” asking “why and how” a deputy to al-Qaeda’s leader had allegedly managed to travel to the Syrian province. He said it might not be the best approach for some partners of the US “to send tens of thousands of weapons and turn their faces to the other side as foreign fighters enter this area,” according to reports. The US, McGurk reportedly said, intended to work with Turkey to have the border closed to recruited militants. Ankara has strongly denounced McGurk’s “provocative” remarks, accusing Washington of terror sponsorship in Syria by supporting the Kurdish People’s Protection Units (YPG), which Ankara views as the Syrian branch of the Kurdistan Workers’ Party (PKK), a militant group that has been fighting the central Turkish government since 1984. “Our reaction to the statements of Brett McGurk, in which he associated Turkey with the presence of terrorist organizations in Idlib, was brought to Mr. McGurk’s attention at a high-level démarche, and his statements, which could be characterized as provocative, were protested,” Turkish media on Monday quoted Foreign Ministry spokesperson Huseyin Muftuoglu as saying. Muftuoglu also said that the US had to end its support for the Kurdish Democratic Party, aka PYD. A Turkish Foreign Ministry official, who asked not to be named, also told Hurriyet Daily News that Foreign Ministry Deputy Undersecretary Sedat Onal had urged the US envoy to “correct” his statements. The official added that Onal warned that such remarks could harm mutual cooperation between Turkey and the US, which is seeking cooperation with Ankara for the post-Daesh period in Syria. Syria has been gripped by militancy since March 2011, when a section of the opposition in the country took up arms against President Bashar al-Assad. A vast mix of foreign terrorists soon blended with the armed opposition, joining the fight against the Syrian government. Two articles, 1) Jonathan Ofir in Mondoweiss, 2) Nir Hasson, Haaretz premium. But it really depends whose weapons you are counting, and whether Israeli weapons count. And whose ‘terror’. There is a problem in defining the event as terror, something that Israel’s politicians from left to right are doing – see for example Labour’s new leader Avi Gabbay, calling it a “vile terror attack” and the gunmen “despicable murderers”. But as Gideon Levy notes in Haaretz, “the shooting of two police officers on the Temple Mount has a motive, a reason and deep roots. But discussing them is considered treason and a justification of terror”. Indeed, the gunmen were acting solely against security forces of an occupying power. That the Palestinians were citizens of Israel (over 2/3 of Palestinian citizens of Israel identify as Palestinians and not as ‘Israeli Arabs,’ as Israel defines them), does not change their affiliation as Palestinians, and Israel’s unilateral annexation of East Jerusalem does not change the fact that this annexation is considered null and void by international law. But for the Israeli mainstream, such discussions are hardly being had, even in cases where the alleged assailant is a Palestinian who is not a citizen, as in the case of Fadi Qanbar who ran over a gathering of soldiers, killing four before he was shot dead, on January 8th, also in East Jerusalem. These considerations and definitions may seem somewhat pedantic to some, but they are, actually, rather crucial towards the understanding of a bigger paradigm of terror, of which Western media often obscures our understanding. Thus, I would like to take us back to 1967, when Israel conquered East Jerusalem. This is the beginning of the recent half-century paradigm of occupation, under which Al-Aqsa is geographically and politically placed. The first act of Israeli state-terror conducted near the Al-Aqsa compound was the razing of the Mughrabi (Moroccan) quarter adjacent to the Al-Aqsa compound and the Western Wall, in the immediate wake of the war (10th-11th June). The quarter, dating back about 7 centuries, was ethnically cleansed of its 700 residents, and 135 homes flattened. Certain structures on the neighbourhood‘s periphery were initially retained, most notably a mosque near the Bab Maghribeh, and the Zawiyya Fakhriyya. Both, however, were eventually razed in 1969. This crime was undertaken for the ‘holy purpose’ of clearing a huge plaza in front of the Western Wall so that Jews could access it more easily. The decision to do this was made by the top military echelon, specifically defence minister Moshe Dayan, and Chief of Central Command Uzi Narkiss, but it also involved Jerusalem mayor Teddy Kollek as well the Military Governor of East Jerusalem Shlomo Lahat (later mayor of Tel Aviv). There was no formally written decision on this razing (in order to avert opposition), and they used private contractors, who performed the task with a rather religious zeal and called themselves “The Order of the Kotel”, meeting under this nostalgic fraternity until the 1990s. Bear in mind, that the decision-makers here, as well as those carrying out the job, were generally seculars, leftists, ‘liberals’ – not some overtly religious fanatics. But there were also more overtly religious fanatics. Fortunately, Narkiss refused, and ‘only’ implemented the ethnic cleansing of the Mughrabi quarter. It is almost impossible to imagine what would have happened if Narkiss had heeded the advice of the zealous General-rabbi. Israel’s recent closing of the Al-Aqsa mosque for Friday prayers in the wake of the shootings is noted as a very rare event. Such a closing occurred in 1969. This was due to… Judeo-Christian terrorism. On the 21st of August 1969, an Australian Christian named Denis Michael Rohan set fire to Al-Aqsa mosque. Rohan was a volunteer in kibbutz Mishmar Hasharon, and was a member of the Church of God, a California-based evangelical sect which had founded Ambassador College in Pasadena, California. His engagement consisted chiefly of listening to the sect’s “World Tomorrow” programme beamed from Radio Amman in Jordan, according to an investigation by the Jerusalem Post. “I’m Jewish, I’m Jewish,” he cried. He spoke to his companion of the imminence of the Messiah’s coming and the construction of a new temple. “What about the Dome of the Rock?”, asked his companion, referring to the shrine at the Al-Aqsa compound. Denis Rohan, who succeeded in setting fire to al-Aqsa Mosque, is being led by police to his trial in Jerusalem. Photo from Jerusalem archive. After his arson attack, Rohan was arrested on the 23rd of August, tried, and found to be insane. But if Rohan was ‘insane’, what does this say about Rabbi Goren? Rohan was merely attempting to enact what Goren was advocating. Had Rohan himself been a military commander, he may have had more impressive success. And his ideology? If that was insane, what does this say about the millions of Christian Zionists the likes of John Hagee? Or for that matter, what about US Chief Strategist Steve Bannon and his Judeo-Christian white-supremacist ‘Camp of the Saints’? When an assumed terrorist is Muslim, we don’t have to wait very long to call it terror. Islamic terror, of course. But it’s interesting how, when a terrorist is Christian, and even explicitly notes their Christian ideology (as with Norwegian mass murderer Anders Breivik), then it begins to go funny. Bill O’Reilly said on Fox News that it’s “impossible” that Breivik was a Christian – because “no-one believing in Jesus commits mass murder”. Fox news is, by far, the most trusted news channel in the USA. In addition, Breivik had specified clear Zionist affinities in his 1,500-page manifesto. Former head of the Anti-Defamation League Abe Foxman opined that this advocacy was ‘bizarre’: “One bizarre twist to Breivik’s warped worldview was his pro-Zionism – his strongly expressed support for the state of Israel”, Foxman wrote in the Washington Post. So, if it’s not Muslim, the notion of Christian, or Jewish, or Judeo-Christian or Christian-Zionist terror is generally considered quite ‘bizarre’, even ‘impossible’. And do we even see it when it is enacted at state level, on behalf of the Jewish State–that is, in a very Jewish sense? According to former Likud Member of Knesset Ehud Yatom, who was a security official and commander of the operation to seize the members of the “Jewish Underground” terror group, the members were “very close” to blowing up Al-Aqsa in 1984. Speaking on the Channel Two “Meet the Press” program in 2004, Likud MK Tzahi Hanegbi said: “There is no information about specific individuals, because the Shin Bet [security service] and police would not let them continue [with their plot]”. Oh, that sounds reassuring. They promised to behave, I suppose. I wonder what would have been the fate of these people if they were Palestinians, plotting to, say, blow up a Tel-Aviv mall. Indeed, these people speak freely and incite terrorism on public radio. And not just any radio – Israeli Army radio. One of the leaders of the Jewish plot to bomb Al-Aqsa, Yehuda Etzion, spoke on Israeli Army Radio in 2004 and called the plot a “worthy” goal. So, apparently, Israel was very confident in its assessment of security concerning the Al-Aqsa compound as mentioned. But apparently its failure to detect weapons at the compound on the 14th of this month, meant that it would immediately and unilaterally impose a set of metal-detectors and new security screenings, because for once, the weapons and the threat came from within the Al-Aqsa compound, rather than against it. Israel acted unilaterally in imposing this, as well as in closing the site for two days after the attack, although under the status-quo agreement (signed under peace agreement with Jordan 1994), Jordan is the custodian of the site and the Islamist Waqf is the protectorate. So Israel was basically saying to the world, to the Palestinians, to Muslims: ‘we own this place’. It was saying, that since its security personnel was killed, that’s just a red line and then we can do as we like. All in the name of ‘security’, of course. To hell with how many will die due to the way we handle it. The greater paradigm here is that of continued occupation. For so many Israelis and Israeli apologists, when it comes to East Jerusalem, the occupation doesn’t exist. It’s because it’s a ‘united capital’ according to Israel’s basic-law definition (1980) which cemented the illegal annexation from 1967. All of that is illegal under international law and according to the whole world. But in Israel’s universe, that world doesn’t exist. That’s why people like the influential New-York Times columnist Thomas Friedman cite ‘420,000 settlers’ of the West Bank, omitting East Jerusalem settlers (another well over 200,000) from the count – essentially ‘giving’ East-Jerusalem over to Israel – as he did in a recent column. The greater paradigm is that of Israeli state criminality, Israeli state-terror, which pertains to much more than just Al-Aqsa. But Al-Aqsa is admittedly a very sensitive scene, where a drop of Israeli arrogance can serve as a match to light the highly combustible Palestinian, and Muslim, street, just as the late Israeli Prime Minister Ariel Sharon did in his Al-Aqsa visit in 2000, ‘demonstrating presence’ with 1,500 security personnel and igniting the 2nd Intifada. Those who think that this is all just about some metal detectors, and that it’s ‘unreasonable’ for this to be such a big deal, are missing a bigger picture. For them, focusing on metal detectors alone, and forgetting the rest of the oppression, serves to confirm their view of this being ‘unreasonable’. For them, this is an “artificial crisis”, the term which Haaretz analyst Amos Harel uses. Calling this ‘artificial’ is arrogant, because it suggests that there is nothing in the situation itself to justify a crisis. But Israel’s control of East Jerusalem is a crisis from day 1. It started with a massive war-crime, and this is etched in the minds of many Palestinians, even if many others have forgotten it or are ignorant of it. The Al-Aqsa compound is occupied as is the whole of East Jerusalem, and it exists within and under this occupation, even if Israel refuses to acknowledge it. It’s all part of a bigger story of oppression, state-terror, state violence. This situation will result in clashes. I have not listed other bloody clashes around Al-Aqsa, such as the Al-Aqsa massacre of 1990, where an extremist Jewish group called the Temple Mount Faithful attempted to place a cornerstone for the Third Temple at the compound, sparking riots in which between 19 and 23 Palestinians were killed with live ammunition and 150 more wounded; or the 1996 riots following the opening of a set of tunnels that Israel dug under the compound, during which about 80 Palestinians and 14 Israeli soldiers died. In such a violent paradigm, which this colonization and occupation represent, even archaeology is seldom benign, and archaeological sites such as the ‘City of David’ site in Silwan, just south of the Al-Aqsa compound, are serving as a pretext for ethnic cleansing and Jewish takeover, the same pattern as the ethnic cleansing of the Mughrabi quarter. So it is clear that there is a real basis for fear on the part of Palestinians, that every step Israel takes unilaterally is another step in a design for further takeover. It’s a matter of nature for colonialists to be arrogant. You have to be arrogant in order to consider yourself worthy of oppressing others. When you’re arrogant, you tend to not see other people’s existence, history, dignity. They disappear under your self-righteous sense of ‘right to exist’ at the cost of the other. And when you do that, you’re playing with fire. You don’t need much to cause an explosion. And then you wonder ‘what have I done wrong?’. Then, in order to preserve your self-righteousness, you call them ‘unreasonable’, and say that you live in a ‘tough neighbourhood’. Schwartz, who was wearing the uniform of the old Haganah police force, left without saying where he was going. “I went up to the apartment to call my mother, she told me he didn’t want to say where he was going,” said Fuchs. “The next day he came back crying. My brother was a pilot then and I was very worried something had happened, but then he told me that he had been in the Old City and touched the Kotel. He told how at night they demolished all the Mughrabi neighbourhood. He was completely secular, but he said that when they worked there was a mystical feeling, they felt they were on a mission,” she added. 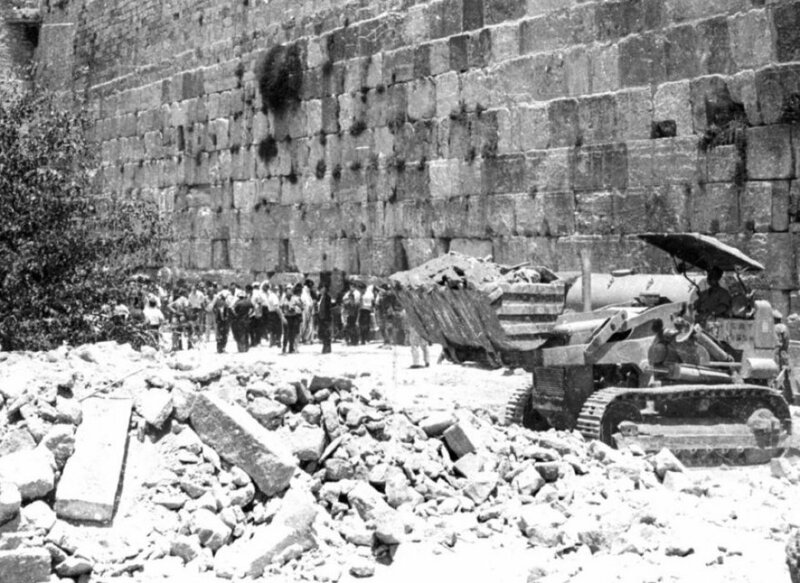 Schwartz was one of 15 older contractors from the Jeruslaem contractors association who were called on by then Mayor Teddy Kollek that night to come to the Western Wall, which had just been captured. The task was to demolish the houses in the Mughrabi (Moroccan) Quarter that was built right next to the Kotel and create the Western Wall Plaza. Kollek enlisted the contractors for the work, but to this day it is still not clear who made the decision about the demolition. It is clear Kollek was involved, as well as Shlomo Lahat, who was the new military governor of East Jerusalem (and later mayor of Tel Aviv), and the head of the IDF’s Central Command, Maj. Gen. Uzi Narkiss. It is clear they intentionally made the decision without asking for – or receiving – permission. No written documents remain concerning the decision, except for a hand-drawn map on a piece of paper that marked the boundaries of the area to be demolished. The contractors’ association was the most readily available source of manpower, but that was not the only reason that Kollek turned to them. The fear of an international protest made it necessary to use an unofficial civilian body to take on the job. The demolition work was given to the Jerusalem contractors and builders organization to distance any involvement of official bodies in the demolition as much as possible, wrote Uzi Benziman in Haaretz Magazine last week (in Hebrew). 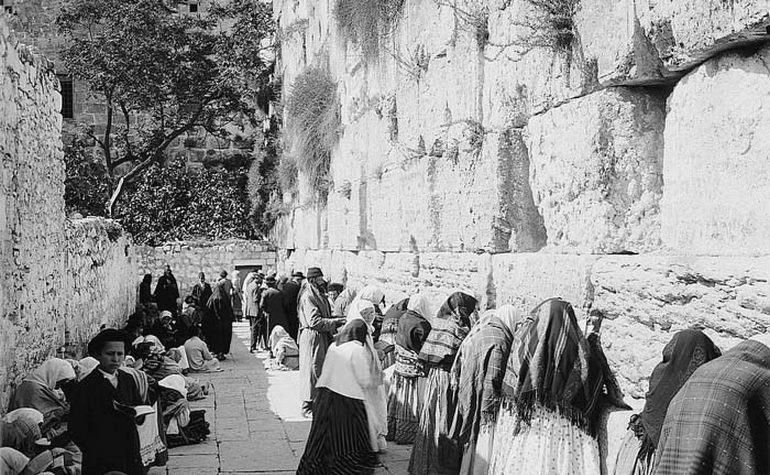 Praying at the Western Wall before the era of rules, regulations and asserting authority. 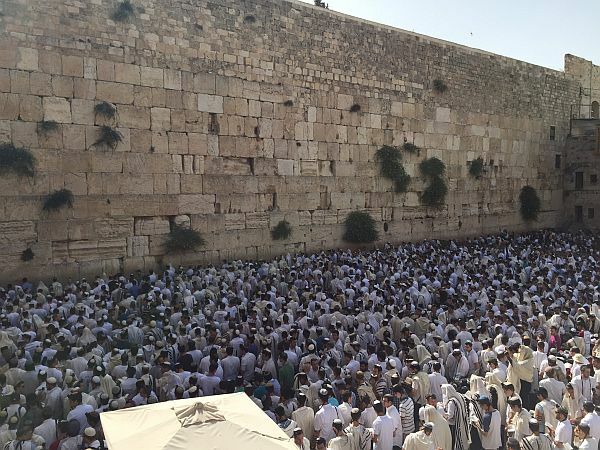 Kollek explained the urgency of clearing the plaza stemmed from the Shavuot holiday in a few days, when tens of thousands of Israelis were expected to flock to the Kotel. Leaving the old buildings standing could be dangerous, said Kollek. But the contractors, who were not called up to the reserves because of their age, saw it as much more than just another engineering project: That night remained engraved in their memories as a historic moment. So much so that after the war they established the “Order of the Kotel,” a sort of imitation of an order of knights for those who “purified the Kotel plaza for the people of Israel,” as they wrote about themselves. A coincidence led researchers from Yad Ben Zvi, the Ben Zvi Institute in Jerusalem named after former President Yitzhak Ben-Zvi, to study the Order of the Kotel story. Next week an exhibition will go on display at the Institute about the Order and the creation of the Western Wall Plaza. Two bulldozers worked to demolish the houses. They ran into difficulties when the rooms underground collapsed suddenly under the bulldozers, but the collapse also provided them with space to bury the rubble and flatten the ground. 135 houses were demolished, and in the end the demolition exceeded the area drawn on the map. Benziman tells how in one case the residents refused to leave the house and left only after the bulldozer rammed the wall. In one house, an elderly woman named Haja Ali Taba’aki was found dead in her bed. In one of the pictures a bulldozer can be seen demolishing a house with furniture, curtains and a vase with flowers inside. Zaban was the father of Yair Tsaban, who became a member of Knesset for the left-wing Mapam party. Shiloni went to the Kotel with her father and remembers the trip and Kollek standing on a crate or step, speaking to those present. During the demolition she was not there, after two officers accompanied her to find her husband, a platoon commander who had been wounded in the fighting. The Order of the Western Wall was founded that same night and the members continued to meet regularly until the 1990s, when most of them passed away. In 1967 they enlisted in another task from Kollek and built the structure near the windmill in the Yemin Moshe neighbourhood of the capital that housed the original carriage used by Moses Montefiore in his travels. In 1983 they published album with almost prophetic predictions by Itamar Ben-Avi, a journalist and son of Eliezer Ben-Yehuda, about the creation of the Kotel Plaza. Ben-Avi died in 1943. In 1987 the members of the Oder attended a ceremony in their honour in the Knesset, and received the “Defender of the Kotel” decoration. The founder of the order was Baruch Barkai, who became the secretary of the group and a rather unusual figure. Barkai was born in Latvia, studied law, was a journalist, art collector and a member of the Lehi pre-state underground, also known as the Stern Gang. He was even arrested on suspicions of being involved in the murder of Chaim Arlosoroff. Barkai later wrote a number of books, two of which are etiquette guides, and founded the most polite Knesset member competition. The Yad Ben- Zvi researchers discovered the story by accident, through a person who participated in the demolition, but not a member of the Order. Ze’ev Ben Gal was born to a Samaritan family, fled his parent’s home, enlisted in the Palmah and lived on Kibbuts Rosh Hanikra. During the Six-Day War he served as a bulldozer driver in the reserves and was called to the Mughrabi neighborhood. During his work he noticed a large iron lock, it seems the lock on the gate to the neighborhood, and kept it. After he died last year, the lock made its way to the kibbutz archive, where they decided to give it, and the story behind it, to Yad Ben-Zvi. An al-Alam photo shows rubble caused by the Saudi Zio-Wahhabi army demolition of Awamiyah, Eastern Province, Saudi Arabia. Zio-Wahhabi forces have set fire to homes belonging to Shia residents in the besieged town of Awamiyah that has been the scene of a heavy-handed regime crackdown on the minority community. Based on local reports, Zio-Wahhabi forces have thrown Shia citizens out of their homes and then torched their properties. Awamiyah, situated in Eastern Province, has long been a flashpoint between the Zio-Wahhabi regime and the inhabitants complaining of discrimination. It has witnessed renewed deadly clashes between the military and residents since May, when Zio-Wahhabi forces began razing the town’s old quarter, known as al-Mosawara. Zio-Wahhabi family claim that Mosawara’s narrow streets have become a hideout for militants suspected of being behind attacks on security forces in Eastern Province. The UN, however, said Saudi Zio-Wahhabi was erasing cultural heritage and violating human rights through Mosawara’s demolition. Karima Bennoune, the UN special rapporteur in the field of cultural rights, said ”Saudi authorities ignored repeated pleas by the world body to halt the destruction”. “These destructions erase the traces of this historic and lived cultural heritage and are clear violations of Saudi Arabia’s obligations under international human rights law,” Bennoune said, accusing the Zio-Wahhabi regime of “irreparably burning down” historic buildings and forcing residents to flee their homes. Additionally, Ali al-Dubisi, the head of the Berlin-based European Saudi Organization for Human Rights, said ” The Saudi forces were following a scorched-land policy in Awamiyah, launching rocket attacks and shelling residential buildings and civilians who are resisting Saudi pressures to evacuate”. Since February 2011, Zio-Wahhabi regime has stepped up security measures in Shia-dominated Eastern Province, which has been rocked by anti-regime demonstrations, with protesters demanding free speech, the release of political prisoners, and an end to economic and religious discrimination. The government has suppressed pro-democracy movements, but they have intensified since January 2016 when Zio-Wahhabi regime executed respected Shia cleric Sheikh Nimr al-Nimr. The dramatic appearance of the Iraqi Shi’ite firebrand politician Muqtada Al-Sadr in Jeddah on Sunday and his meeting with the Saudi Crown Prince Mohammed bin Salman opens an exciting page in the Saudi-Iranian regional rivalries. The theatre is shifting to Iraq. Briefly, what is unfolding is a determined Saudi attempt to reset the power calculus in post-ISIS Iraq by moulding a new political alignment that principally aims at undermining the pre-eminent influence that Iran has enjoyed over its neighbour in the past decade or so following the Shi’ite empowerment in the downstream of the US invasion of 2003. Iran’s main platform on the Iraqi political landscape has been the umbrella Shi’ite coalition known as the Islamic Supreme Council in Iraq (ISCI), which Tehran had created as far back as 1982, originally as a Shi’ite resistance movement against Saddam Hussein and most recently since the middle of the last decade following Saddam’s overthrow as a united front to contest the democratic elections in Iraq with an agenda to preserve the Shi’ite leadership of the government. Enter Saudi Arabia. Quite obviously, Saudis see a window of opportunity to go for Iran’s jugular veins by breaking up the ISCI irretrievably and instead propping up a new composite non-sectarian coalition involving the Shi’ite factions who resent Iran’s hegemony. No doubt, it is an audacious attempt to bring together – you’ve guessed it – Muqtada al-Sadr, Ammar Al-Hakim and Al-Abadi – on the same page. Cynics would say that Saudis are having a devious agenda to: a) break up Shi’ite unity in Iraq; b) empower the Sunni groups as a ruling elite; and, c) create a schism between ‘Arab Shias’ and ‘Persian Shias’. The jury is out. Time only will tell how these shenanigans play out. To be sure, MBS’s initiative to manipulate Iraqi politics must be enjoying the support of the US and Israel, since it ultimately aims at isolating Iran and mitigates to an extent Iran’s spectacular ‘victory’ in the Syrian conflict. Now, that is a statement of fact. And, the ground reality is that today, in the chaotic war conditions in Iraq, power ultimately flows through the barrel of the gun. Stalin would have asked MBS as to how many divisions Al-Haikm, Al-Sadr and Al-Abadi together have under their command? Will the number come to even one half of the strength of Al-Hashd Al-Shaabi, the Iraqi Hezbollah, which Iran trained and equipped? Unlikely. Could they have taken on the ISIS and defeated it? No way. Nazi army shot an unarmed Palestinian minor in both legs and in one arm last week, according to Haaretz. Thirteen-year-old Mohammed Qaddumi was collecting firewood near the West Bank Separation Wall on Tuesday when Nazi occupying forces fired at him. Qaddumi was admitted to Meir Hospital in Kfar Saba and underwent a long operation. His condition remains severe though his health has improved. He was by the fence, the children were there, four children, and there were soldiers under the olive trees. They went up there by the fence, they could have grabbed him by the arm but they shot him three times. His father emphasised that Qaddumi did not try to cross into ‘Israel’ as the army claims, nor did the children throw stones at the soldiers who were hidden from their view. Nazi Civil Administration initially prevented Qaddumi’s family from accompanying their son to hospital in ‘Israel’, but relented after NGOs Mahsom Watch and Physicians for Human Rights intervened. The army is said to have initiated legal proceedings against the wounded teenager, on suspicion of throwing stones. Nazi army have long been accused of implementing a “shoot to cripple” campaign against Palestinians in the occupied West Bank. A report released by the Badil resource centre found that in the first six months of 2016, at least 30 of the 86 Palestinians that were shot in Bethlehem alone were shot in the legs or knees. Nazi generals have also been known to encourage such tactics against Palestinian youth. Reports surfaced last year that Palestinians in numerous West Bank cities speak of Shin Bet officials known only as “Captain Nidal” and “Captain Imad” among others, who regularly threaten to disable young men if they fail to comply with Nazi soldiers. Paul Wolfowitz had his sights on Iraq since his time in the first Bush administration. Former Israeli official and Bush administration official Richard Perle had his eyes on Iraq since at least his authorship of the Clean Break white paper. The Zionist regime had their eyes on Iraq since the 1980s when strategist Oded Yinon wrote his white paper in support of dividing the Arab-Muslim world along ethnic and sectarian lines. The global Zionist lobby has had their eyes on Iraq since Theodor Herzl stated that Eretz Israel’s true borders go from the Nile River in Egypt to the Euphrates River in Iraq. Depleted uranium chemical weapons used by America have been causing massive birth defects. Corporate colonialism of Iraq has decimated its once vibrant agriculture industry. The vacuum of power left by the ousting of Saddam Hussein enabled al-Qaeda in Iraq to form into ISI. ISI would later merge with the various factions of the Free Syrian Army and the Al-Nusra Front (al-Qaeda in Syria), both backed by the U.S./Israel/Saudi Arabia/Qatar/Turkey, to become ISIS. The U.S. airdropped weapons to ISIS, which was no accident. These weapons were anti-aircraft missiles. Does ISIS have aircraft? No, but the Iraqi Army does. Who didn’t kill a million innocent people in a war of aggression based on a lie, who only helped local Iraqis exercise their human right of resistance and self-defense, is somehow the one who is “dominating” Iraq. Not the war criminal puppet presidents George Bush and Barack Obama, along with the Zionist deep state that controls them. The news that President Trump has halted the CIA program to arm and train rebel groups in Syria should be viewed with caution, as the CIA program only represented half of US involvement in Syria. Even if we take this information as completely accurate, and the CIA will cease to be involved in any covert programs in Syria, there is still a giant arm of US imperialism that is going to be heavily involved in the Syrian conflict for the foreseeable future; namely, the Pentagon. These two programs have often clashed, as was the case last year, when militias armed by the CIA fought against militias armed by the Pentagon. The Pentagon has been as involved in the disastrous operation to arm and train rebels in Syria as the CIA has, and has contributed heavily to the mess on the ground. In September 2015 for instance, it was reported that a Pentagon-armed group of rebels – named Division 30 – handed over their weapons to al-Qaeda in Syria, a scenario that was a common outcome from many CIA operations as well. The Pentagon, never shy to blow an obscene amount of taxpayers’ money on imperial matters, has already wasted hundreds of millions of dollars training and arming rebels in Syria, yet Trump only wants to increase the US war budget. Trump’s decision to halt the CIA program was hardly surprising, considering the support Trump has received from large sections of the military. A look at the backgrounds of the individuals that Trump has given cabinet positions reveals Trump’s close relationship with the military. Undoubtedly, there are many good forces in the US military (as in any other large organization), and there is nothing wrong with having a military background. But equally, there are also many nefarious forces in the military, and the influence of military-industrial complex is pervasive, constantly agitating for more imperial wars. With this context in mind, it is hardly surprising that Trump favours the Pentagon program over the CIA one, especially considering the power struggle taking place between the CIA and the military within the US. It should be highlighted that Trump has notcompletely halted all US programs to arm and train militias in Syria, he has merely shutdown one channel. The Pentagon has been heavily involved in arming Kurdish forces in Syria, using them as a tool to attempt to Balkanize and fracture Syria into micro-states. In May of this year, President Trump approved a plan – supported by many in the Pentagon – to arm the People’s Protection Unit (YPG), a Kurdish militia operating predominantly in northern Syria. The YPG is also the controlling militia in the US-backed Syrian Democratic Forces (SDF), which includes an array of other militias. In addition to providing arms to the YPG, US special forces have been pictured on the ground in northern Syria working in conjunction with YPG fighters. When most of the public was distracted by the story of Trump halting the CIA program, footage surfaced showing US armed military vehicles passing through Qamishli – a city in northern Syria on the Turkish border – reportedly on route to Raqqa. The recipients of the vehicles are believed to be either the SDF or US forces directly, who are involved in the battle against ISIS in Raqqa. If (or when) ISIS is defeated in Raqqa, it will be very interesting to see who ends up controlling the city. It is possible that the Pentagon wants to defeat ISIS in Raqqa, and then hand Raqqa to the Kurds – a scenario that many Kurds would only be too happy with. In March of this year, Saleh Muslim, the co-chair of the Syrian Kurdish Democratic Union Party (PYD) – the political affiliate of the YPG – said that once ISIS is defeated in Raqqa, the city should be incorporated into a Kurdish state in northern Syria. The Pentagon’s support for Kurdish forces is clearly part of a strategy to break the northern part of the country away from control of the Syrian government in Damascus. A subservient Kurdish state in northern Syria (which would probably join with Kurdish zones in Iraq and other countries in the future) would allow the US to have a permanent military presence in Syria, and easy access to the natural resources in the Kurdish region. The creation of a Kurdish state in northern Syria would of course cause a severe breakdown in relations with NATO member Turkey, given the views of the current Turkish leadership that is. Turkey considers the YPG to be an extension of the Kurdistan Workers Party (PKK), a group Ankara views as a terrorist organization. Turkey has repeatedly denounced US support for Kurdish groups in Syria, with this being a major source of disagreement between the US and Turkey. It is no coincidence that Turkish state media recently published a list of classified US military bases and outposts in northern Syria, with this information revealing the extent to which the US military is embedded in Kurdish-controlled regions in Syria. The plan to Balkanize Syria is well on its way, and the Pentagon is leading the charge. How Russia positions herself in the coming months will be crucial for the future of Syria.